Arc VECTOR is the safest and most advanced motorcycle ever made. Story: Launched at Milan’s EICMA bike show, the incredible Arc Vector is the most advanced electric motorcycle ever brought to market, utilizing exotic materials, thoroughbred componentry and cutting-edge architecture. A luxury electric motorcycle, styled like a futuristic racer, with a Heads-Up Display (HUD) helmet and intelligent biker jacket digitally connecting the rider with the road. It’s the first model to be produced by Arc, a team of top engineering specialists based in Coventry, the UK’s high-tech automotive heartland. This esoteric new brand aims to become the most desirable battery-powered marque on two wheels. Shows: High quality vision will include the motorcycle reveal, real world B Roll footage of motorcycle, interviews and reviews. 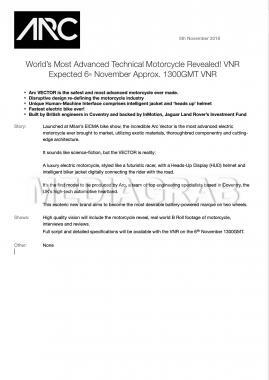 Full script and detailed specifications will be available with the VNR on the 6th November 1300GMT.